WNG’s unique piano action parts are made with carbon fibers and advanced composites that are ten times stronger than wood, are unaffected by humidity and dry climate conditions, and do not tarnish or oxidize. In addition, the piano actions built with these parts are becoming recognized as far more responsive than other piano actions due to the lightness and precision of the parts and their lack of tarnish. “With these characteristics, it’s no wonder that WNG piano action parts are revolutionizing the piano manufacturing, restoration, and repair markets,” states Ludwig Vasicek, Technical Director of Wessell, Nickel and Gross and also Mason & Hamlin pianos in Europe. “Our seminar at NAMM Musikmesse was filled to capacity and all in attendance were truly excited to receive hands-on information on the use of our products,” Vasicek continued. 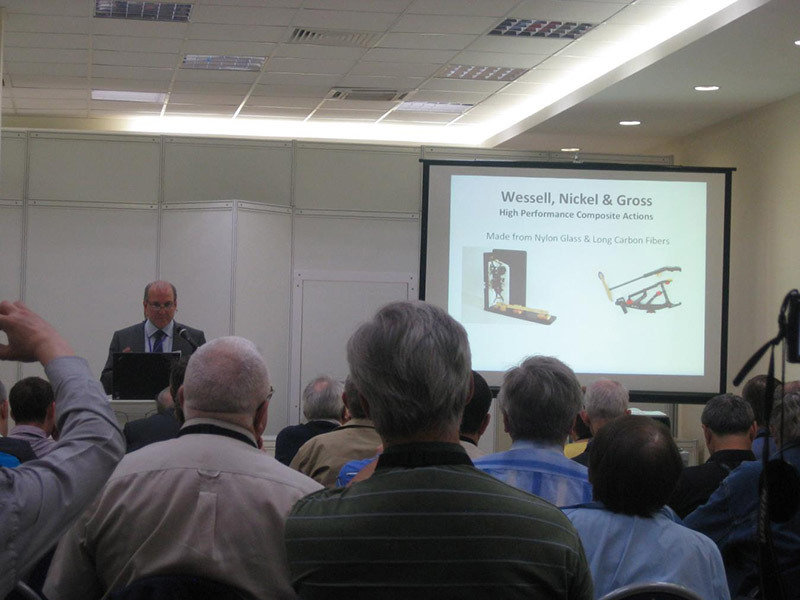 The all-day seminar workshops hosted by the Russian Piano Masters Association were attended by over 100 inquisitive piano technicians as they received an introduction to WNG, Mason & Hamlin pianos, and PianoDisc player piano products. The workshops covered in detail the service and maintenance, installation, and WNG product characteristics and benefits; and they ended with honors for the certificated technicians. WNG, Mason & Hamlin, and PianoDisc plan to once again share their expertise at the 2013 NAMM Musikmesse in Germany and Moscow and 2013 NAMM in Anaheim, California. Convention and workshop details will be forthcoming within the next month. Wessell, Nickel & Gross (WNG) was founded in 1874 by Otto Wessell, Adam Nickel, and Rudolph Gross, each an accomplished piano action maker. The three met while they were under the employment of Steinway & Sons and quickly became friends. Wessell, ever ambitious, urged Nickel and Gross to leave Steinway and start their own piano action business. The two agreed, and Wessell, Nickel & Gross was formed. Today, under the leadership of the Burgett Brothers, WNG has brought back the ideals, innovation, and standards of craftsmanship that the original founders once had, and is poised and ready to bring the company back to its original status as the best piano action maker in the world. See www.wessellnickelandgross.com. Established in 1854, Mason & Hamlin is one of America’s oldest names in piano making and a pioneer in piano design and manufacturing technology. Mason & Hamlin builds its high-end, handmade pianos in its factory in the USA (Haverhill, MA) and its line of vertical and grand pianos is sold in countries across the globe. Its sister company, PianoDisc, manufactures the world’s best selling piano player system and other retrofit systems. Established in 1988, PianoDisc has over 600 dealers and distributors in 40 countries. PianoDisc is headquartered in Sacramento, CA, and has offices in Germany and China. See www.masonhamlin.com and www.pianodisc.com.